Start really believing in yourself to move forward and unleash your greatness! Do you find it difficult to finish things properly? Perhaps you find yourself avoiding new situations and experiences? Maybe you feel that you just don’t push yourself to your full potential? This Fear of Failure Hypnosis MP3 can help you to overcome these issues. Fear of failure is a common reason for these sorts of problems, and it certainly seems that some people find these sorts of things more difficult to overcome than others. Whether driven by perfectionism, low tolerance of uncertainty, past experiences or childhood situations, inability to overcome fear of failure can get in the way of a successful and satisfying life. My Fear of Failure Hypnosis MP3 session will help you be more forgiving towards yourself, help you develop a boundless curiosity and enjoyment of new challenges, and help you change the way you approach success to make it more fun and much less daunting. Steve G. Jones, Ed.D., Clinical Hypnotherapist, charges $1,500 for a custom recording and $25,000 for a one-hour private hypnotherapy session at his office. But you can get all the benefits for this low price. Simply listen to the Fear of Failure Hypnosis MP3 audio every night as you go to bed for three weeks and feel the changes happening in your life. You will feel more empowered, more in touch with your true self, and you will truly know that your goals are within your reach. Steve G. Jones achieves AMAZING and LASTING results!!! Hypnosis is the easiest way to affect change in your life because the positive messages go straight to your subconscious mind effortlessly so you can accomplish your goals and reach for the stars!! All you have to do is listen to the Fear of Failure Hypnosis MP3 download at night as you go to sleep!!! You’ll hear soft music, the gentle sounds of the beach, and the soothing sound of Steve G. Jones’ voice all working together to bring about positive changes in your life easily and naturally. Steve G. Jones has been helping people improve their lives with hypnosis for over 17 years…now it’s time for him to help YOU… don’t wait, do it NOW !!! you’ll be glad you did. See you at the top! If you are afraid to try new things because you may fail, hypnosis is the answer. Fear of failure is a common concern for those who are perfectionists. Such fears, however, can get in the way of trying new things and fully enjoying your life. Hypnosis is not going to change who you are. It will change attributes you would like to see changed, such as avoidance of new things because you fear failure. In order to overcome this fear, you need to learn how to deal with it. Positive thinking is a common approach, but not one that will necessarily teach you how to cope with failure. Everyone fails at some things some of the time. It is a part of learning and growing. But if not being able to handle that reality is the situation you find yourself in, then hypnosis can change that attitude about failure. With hypnosis, you learn to relax. Once a state of relaxation is achieved, the hypnosis works by organizing thoughts. It can take irrational thoughts you may have about failure and replace them with the right thoughts that help you cope with failure. Once you know you can fail and still move on, or that failure once is not a reflection on how you will always perform, then you can have the tools needed to boldly and confidently try new things. Clinical Hypnotherapist Steve G. Jones has created a self-hypnosis program called, Overcome Fear of Failure. In it, he uses the best hypnosis techniques to help you relax and prepare your mind for the information that will change the way you view and cope with failure. The only real failure, after all, is someone who fails to try. If there is one thing I have learned over the years, it’s not to be afraid of taking a chance. I often ask myself, “What’s the worse that could happen?” Failure is the worst thing that could happen, but the best thing that could happen would be success. For me, the possibility for success far outweighs the possibility of failure. I’d like for you to take a moment out of your day and think about something for a minute. I want you to think of something that you have dreamed of doing, but something has been holding you back. I want you to put down everything that you are doing right now and come up with a plan, that’s right! I want to motivate you to take a chance on something you feel passionate about. Perhaps you want to change your career or perhaps you want to try something new. Whatever it is that you want to do-Do it! Take the first step right now!! Chances are that taking this risk will vastly improve your life. You should strive to be the best person you can be. Once you have a goal in place, be sure to stay on track. Keep a positive attitude at all times. And if you hit a roadblock along the way, that’s okay because you will be able to figure a way around the roadblock. Realize that if you fail, you can re-evaluate your actions, make changes, and try again. The only way to learn is by making mistakes every now and then. And as you continue to relax and unwind, you realize just how powerful you are. You are an amazing person. I’d like you now to take a moment and just reflect on all the wonderful, amazing things about you. Your creativity, your intelligence, your sense of adventure, your desire to succeed, your acceptance of yourself. All of these things make you such a wonderful, beautiful person. You realize now just how wonderful and powerful you are and as you breathe in deeply now, breathe in confidence. And as you exhale, let go of any uncertainty, let it go. And breathing in again, breathe in motivation and power. And as you exhale, let go of doubt, let it go, let it go. You’re so relaxed and at ease and confident. I would like you know to imagine a goal or project, something you would like to accomplish, that’s right. And I would like you to imagine already having accomplished it. See yourself there. Notice how powerful you feel. Notice how relaxed you are. Notice how easy it seems to have accomplished it, that’s right. I would like you now to remember all the steps that went toward accomplishing that goal or project and notice that along the way, perhaps there were some situations that were a challenge, that’s right. And notice how you dealt with those situations, easily and effortlessly, easily and in a very relaxed way, that’s right. You realize that with any goal, there are challenges and you are always up to the challenge, that’s right. You are always up for the challenge. You are relaxed and confident, that’s right, relaxed and confident. And you see those challenges as necessary steps and you deal with those challenges very quickly and efficiently, very quickly and efficiently as if you were a gladiator. And those challenges are very easy to defeat, very easy to defeat because you are a mighty gladiator and you are able to defeat any challenge that arises easily and effortlessly, that’s right. And as you breathe in deeply now, breathe in strength and courage. And as you exhale slowly, let go fear, let it go, let it go, let it go. You are able to accomplish anything you choose to accomplish. Any goal or project you wish to accomplish, you will accomplish easily, meeting all the challenges along the way. And as you come back now into the present, look to the future. Look to that time when you have finished that goal, that’s right. And see a clear path now, see the challenges, but remember how you overcame them easily and efficiently. And realize now that there is a clear path to your goal, a clear path to your goal. And you will now walk that path easily, letting go of fear, breathing in strength, breathe it in, breathe in that strength and courage. And as you exhale, let go of fear, let it go. You are a mighty warrior and you will reach your goal and you will reach your goal easily, so relax, relax, relax now. The fear of failure is within all of us. We all want to be successful people, but you have to ask yourself if you are really working toward success. If you are not constantly striving for success, then perhaps you have a fear of failure. Fear of failure will hold you back from realizing your dreams. But it doesn not have to be that way. If you feel that there is something holding you back from realizing your dreams then you probably have a fear of failure. Having a fear of failure can be debilitating and can be the reason why you are not living up to your potential. Self-hypnosis is a powerful tool to use to get over your fear of failure. 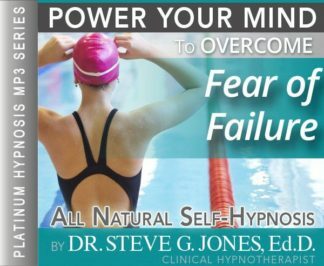 Steve G. Jones will give you powerful suggestions that your subconscious mind will listen to and help get you going. Hypnotherapy will help you to take action and work on becoming a success. This powerful Fear of Failure Hypnosis MP3 recording will help you realize that even if you take a stumble along the way, you will confidently get back up and keep working toward your goals. Failure is just a state of mind. Even if something does not go your way, you are not a failure. Hypnosis will help you learn from mistakes and grow and strengthen so that you can take on whatever comes your way. This recording will help you to become patient and persistant. Giving up will no longer be an option for you. Most people with the fear of failure have a hard time moving forward. They are often frozen from reaching their goals because they fear that if they work toward their goals, they might not succeed, but instead fail. If this sounds like you, then you can greatly benefit from the Overcome fear of Failure self-hypnosis recording. It will dramatically change your life. Hypnosis works on deep-rooted ideas that you have held onto for a long time. Very easily and efficiently, hypnotherapy allows you to let go of those negative thoughts. Listening to the Fear of Failure Hypnosis MP3 recording will help you get over your fear of failure in an easy and natural way so that you can go on to achieve amazing success!